In 1865, one star was added, representing Nevada, bringing the total number of stars to 36. There were thirteen stripes representing the thirteen original colonies. 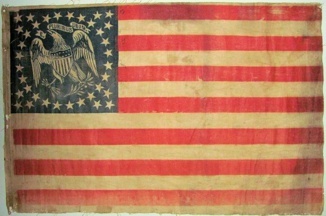 This flag from 4 July, 1865, to 3 July, 1867. The design called "The Great Star Flag" had 36 stars, and several patterns reflect this interpretation of the Continental Congress description of "a new constellation." Based on an item on eBay, purported to be a civil war era 36 star "great star" flag measuring approximately 42" x 67". This flag is in excellent condition for a flag that is approximately 150 years. It's colors are extraordinarily vibrant compared with other examples. The flag is constructed of what appears to be merino wool and the stars and stripes on the flag are treadle machine sewn. The stars on the flag are double appliqued and the flag has two small grommets on the hoist. I tried to approximate those lighter colours. I still wonder whether they used lighter colours at the time, or whether the paints they used faded. If it's for real, it does show the variation between such flags, even when the luminary design itself is the same. This "Wagon Wheel" design is another sample of a circle of stars with an inner design. A close look will reveal a circle of stars within the outer circle with a five-point 'star cluster' in the middle. It was also a favorite naval pattern well into the 19th century. 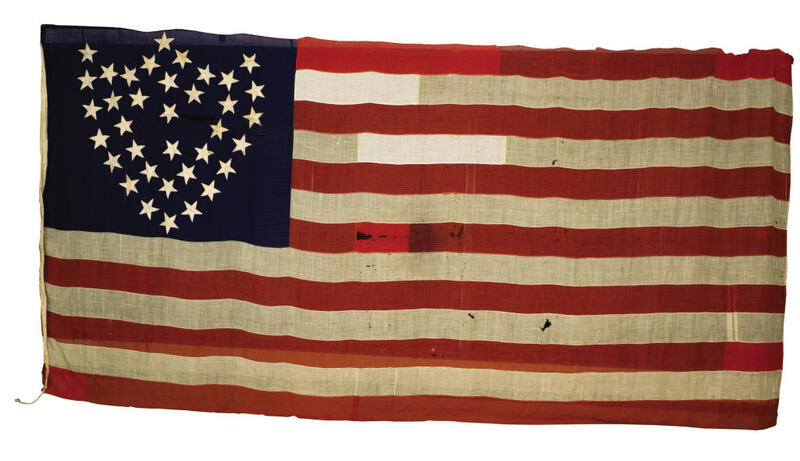 The "Windblown Flag" of thirty-six stars was once the possession of Civil War veteran, Louis Bernard, later a pioneer in Oregon. The canton's illusionistic design that appears to taper at one end, creates the impression that the flag is in motion - or "windblown" - even when at rest, as shown here. A rather mixed canton makes a very different design here. Could this be an aerial bomb? This flag was not used widely with only a few confirmed uses as a garrison flag. Posted on Ebay, this circa 1865 vintage US parade flag is printed on glazed cotton muslin. Printed in the canton is an American Eagle encircled by 36 stars. The eagle design in this flag is an obvious variant of the Great Seal of the United States". The star count of 36 suggests the date of July 4th 1865. I've located two similar examples which have come into public awareness over the last 7 years although I suspect there are a couple others. A 34 star variant was offered at a Cowan's auction in May 2003 and a 35 star variant which is even more closely related to our flag is pictured on page 63 of the 2005 book titled "The Stars and Stripes, Fabric of the American Spirit" by J. Richard Pierce with foreword by Jeffrey Kenneth Kohn, M.D. I believe this flag is by the same maker as the Pierce example as the "E Pluribus Unum" banner in the eagle's beak was reversed in the 35 star flag and corrected one year later in the 36 star flag. Albeit, this is the latest of the three flags sited, each variant is important as its own unique and quite scarce example. Flags with an eagle in the canton were typically used during the Mexican American and Civil War periods of which 1865 would have included 4 war months however the Civil War had concluded when this 36th star was officially added on July 4th. Exterior dimensions are about 16-1/8" X 10-5/8". It is heavily printed on one side only but ink saturation makes the design clearly visible on the obverse. 23rd Army Corps Flag Made from Captured Confederate Flags in Macon, Georgia Converted into a U.S. Stars & Stripes U. S. Flag A very unusual Civil War flag, consisting of captured Confederate flags from the arsenal in Macon, Georgia during Sherman's March to the Sea. The 35-star configuration in the form of a shield represents the 23rd Army Corps, a large regimental corps flag of wool bunting, 108" x 228." The obverse hoist marked "H. Kitchell," the commander of the 98th Illinois. The reverse hoist is also marked "E. Kitchell" and "EK." Accompanied by a large file of Kitchell newspapers and documents, including the original label for the history of the flag written by Kitchell documenting that this was made from captured Confederate flags at Macon, Georgia at the end of the Civil War on April 20,1865 by the 98th Illinois Regiment.